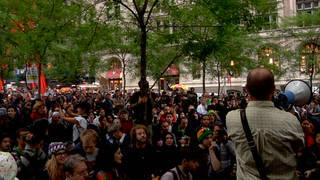 “The Uprising: An Unauthorized Tour of the Populist Revolt Scaring Wall Street and Washington” | Democracy Now! Political organizer and nationally syndicated columnist. His new book is The Uprising: An Unauthorized Tour of the Populist Revolt Scaring Wall Street and Washington. He is a senior fellow at the Campaign for America’s Future. AMY GOODMAN: As we continue to look at issues regarding the 2008 presidential race, we turn to political journalist, nationally syndicated columnist, David Sirota. His first book, Hostile Takeover, was a Times bestseller. His latest book, just published, is called The Uprising: An Unauthorized Tour of the Populist Revolt Scaring Wall Street and Washington. David Sirota, Welcome to Democracy Now! DAVID SIROTA: Thanks for having me. I appreciate it. AMY GOODMAN: Why do think there’s an uprising going on in this country? DAVID SIROTA: Well, you look at the major social indices right now, and people are really, really angry, and you can see it in the polling, you can see it in market research. And I think what’s really interesting right now is that we’re seeing a level of anger and a level of disaffection not just with the government, but with major other institutions in society. Gallup’s poll shows that the anger in the country rivals, in terms of anti-government anger, or dissatisfaction with the government rivals that of the late 1970s. What’s different is that there is an increase in anger at corporate America, at big business, at banks, at the financial system. And I think that that means that gives us a real opportunity — progressives — a real opportunity to take this momentary uprising and explode it into a full-fledged political and social movement. The danger is, of course, is that the anger could go into a right-wing direction. In the late 1970s, you had a moment where you had, after Watergate, Jimmy Carter came in, was elected, didn’t — his administration didn’t really go anywhere, and the uprising of that post-Watergate era really didn’t end. Instead, it intensified, and Ronald Reagan and the conservative movement came along and took advantage of it and exploded it into the conservative movement that we’re living under. And so, we’re really at a moment here where it could go in a progressive direction or it could go in a conservative direction. JUAN GONZALEZ: In terms of it, I mean, it’s clear that there is an enormous public dissatisfaction, but the question in my mind as to whether the dissatisfaction has manifested itself into organized popular movements is the real — because there’s enormous energy now behind the political campaigns, but I don’t see that much street or grassroots energy in terms of organized groups that are battling in sort of an independent or progressive direction. DAVID SIROTA: Well, I think we’re in this middle ground here. The uprising, as I describe it, is sort of that middle stage between disengagement and chaos and a real organized social movement. So what I did is I — in the book, I went around the country and looked at who is organizing around this, both politically and, equally as importantly, in terms of direct action. So I went everywhere from Seattle, with workers who were trying to organize Microsoft workers into a union. I went to — snuck into the Exxon Mobil shareholder meeting with shareholder activists who were filing shareholder resolutions against Exxon and other corporations. I went to the California-Mexican border, which is the sort of right-wing expression of this populist moment. I went with the Minutemen. So — and I was here in New York with the Working Families Party, which has used the fusion voting system here in New York and is trying to use it in where it exists in other states to fuel this uprising. I certainly agree with you. The question is, is whether this election and the focus on the election is going to deter from creating a real social movement. Barack Obama, in particular, is portraying himself as a social movement unto himself. And I understand why he’s trying to do that. He’s trying to win the election. But the issue is whether the country and whether this uprising will think that if he is elected, the work of the uprising, the work of creating a social movement, is over, rather than what the election really should be, which is a beginning point. AMY GOODMAN: David Sirota, you talk about conflicts of interest within the antiwar movement: the antiwar movement, which enjoys widespread support, and the politicians who ally themselves with pro-war consultants. DAVID SIROTA: Right. What happened, in the chapter that I reported on the antiwar movement, is back in 2007, what we found is that you just had an election where the Democrats were elected promising to end the war, and what ended up happening was that the same Democratic Congress refused to really do what it takes to actually end the war. And part of that was, I think, a strategic decision on behalf of the antiwar organizations in Washington about how they said we could end the war. You had consultants who were simultaneously being paid by the Democratic Party and Democratic Party politicians. DAVID SIROTA: You had Hildebrand Tewes. You had consulting firms. They were the lead consulting firm. And I don’t mean to pick on them. It’s just that they were the consulting firm that was heading up the major coalition in Washington of antiwar groups. And so, the strategy that came out of those antiwar groups was we have to simply bash the Republicans to end the war, when in fact, of course, Congress was controlled entirely by Democrats. Last I checked, Democrats have forty-one senators in the US Senate, if they wanted to filibuster a bill to continue funding the war. They haven’t done that. Yet the strategy kept saying, well, we have to only focus the ads, the media buys and the pressure on Republicans. It was sort of a dishonest strategy, and I think it had something to do with the fact that you have organizations in Washington that put partisan affinity over movement goals. JUAN GONZALEZ: You mentioned earlier this whole effort to organize Microsoft or white-collar workers. What are the unions that are doing that? What kind of success have they had? And what kind of impact could this have long-term in terms of the US labor movement? DAVID SIROTA: I spent my time with a union called WashTech, Washington Alliance of Technology Workers, that are affiliated with the Communication Workers of America. WashTech, in their efforts to unionize Microsoft, has found that though the company has executives who, you know, wear khakis and are more casually dressed, those executives are equally as anti-union as the Wal-Marts of the world and as of the other anti-union companies of the world. They’ve had a very difficult time at Wal-Mart. However, the effort to unionize high-tech workers has had success in other places. WashTech has unionized locally there an AT&T call center. CWA, in general, has had success, is having increasing success. But what they’ve found is, again, is that this anti-union, anti-labor ethos in corporate America does not stop in Silicon Valley, does not stop in the high-tech world. And, of course, this is a growing segment of the economy. So what I said in the book was, the reason I looked at particularly high-tech workers and that part of the economy is because it’s so un-unionized right now, and it’s a growing part of our economy. And the question of the labor movement’s future has at least a little bit to do — in fact, a lot to do — with whether that sector of the economy can be unionized. AMY GOODMAN: We’re talking to David Sirota. The Uprising: An Unauthorized Tour of the Populist Revolt Scaring Wall Street and Washington is his book. Talk about the history of superdelegates. DAVID SIROTA: Yeah, this is a really important thing. You know, we’ve heard a lot about superdelegates now, and people haven’t really asked, well, why was it set up? Why was the superdelegate system set up? Well, the basic history is, is that after the 1968 convention, when there was a lot of violence and people were unhappy with who was nominated — remember, Hubert Humphrey didn’t run in a single primary, and he was nominated at the convention to be the Democrats’ nominee, and people were upset that he wasn’t more vociferously against the war in Vietnam. And so, what happened was there was a reform commission between then, the ’68 election, and the ’72 election that opened up the process that said that there wasn’t going to be these backroom deals to anoint a nominee. We’re not going to have another nominee that never runs in a primary. And what ended up happening was George McGovern was nominated. And George McGovern went on to lose the 1972 election by a huge margin. And what ended up happening was, as I say in the book, is that this McGovern fable was created. The party elders, who didn’t like the fact that the process had been opened up, because it threatened their power, created this idea that the reason George McGovern lost was because he was nominated by the public’s will. There was — he was chosen by the public, and they needed elders to pick a more, quote-unquote, “electable” candidate. And so, eventually, a “superdelegate,” quote-unquote, system was set up to reassert the power of the party elders. So in other words, the superdelegates literally exist specifically to prevent the will of the people from being expressed in the nomination process. And I might add, what’s really kind of sad and funny about it is that these are the same superdelegates who gave us President Dukakis, President Mondale, President Kerry, etc., etc. Point being is that the idea that party elders are such strategists that they know how to pick better nominees than the people hasn’t really been borne out. AMY GOODMAN: But explain again who they are and who chooses them. DAVID SIROTA: Right. They are party officials. They are elected politicians, oftentimes former elected politicians. What they do is — and I think it’s about 40 percent of what you need as a presidential candidate to win the nomination are superdelegates, people who have more power, for instance, than the entire primary of New York and California. Right? So you have, essentially, a group of people who may be elected inside the party structure, but have no obligation to the mass public’s voting in these primaries. DAVID SIROTA: But then the question is, why have a primary, right? I mean, you’re either going to have it one way or the other way. And the party, if it’s going to be a small “d” democratic party, really has to choose. And clearly it hasn’t chosen. In fact, it’s got a system built in to, if it wants to, make sure that the party elders, the institution, the establishment, can literally thwart the will of the people. AMY GOODMAN: How does it work in the Republican Party? DAVID SIROTA: Well, the Republican Party is a winner-take-all system in their primaries, and so that has really -— that has essentially, at least to this point, negated any real party control in terms of the votes. I mean, there’s all sorts of party control with who gets the money. Remember, George Bush back in 2000 didn’t need a superdelegate system, because he had all the money in that primary. But the winner-take-all system means that there isn’t that question at the end. I mean, in the Democratic Party, the proportional representation means that the superdelegates themselves could play again — and Hillary Clinton, I think, is banking on this — a decisive role in overturning the will of the election. AMY GOODMAN: It’s interesting, the contradiction for Hillary Clinton, because on one hand she’s saying, “Michigan and Florida should be counted, because we believe in one person, one vote; how can we exclude the population of two states?” and on the other hand banking on the superdelegates. DAVID SIROTA: That’s exactly right. And what I find really, really, really appalling, actually, is the stuff about Michigan, where she’s saying — she’s complaining that Barack Obama got any delegates, because she said, you know, he didn’t run in the primary. And yet, she’s also saying that the Michigan primary should count, right, it should really count, even though he was the one who respected the rules and didn’t put his name in. So she’s basically saying, it wasn’t a real election, but he shouldn’t get anything anyway, because he wasn’t involved. It’s really — the logic is, I heard somebody joke, the consistency is that she will say anything in order for herself to get elected. AMY GOODMAN: Do you think the superdelegates will now be challenged after this year, the whole system will be challenged? DAVID SIROTA: I certainly hope so. And I certainly think — I certainly think that they are an outdated, antiquated system. I mean, the problem is, is that I think what could happen, if Barack Obama loses, I think Hillary Clinton will make the case, a sort of “I told you so” case. I don’t think it will be fair, but she will say, “You see? The superdelegates should have put me in, should have nominated me.” And she might even make the case in a 2012 presidential campaign, in general. That might be the theme: “I told you so. I told you we needed to nominate me, and not somebody who was less experienced.” So if Obama loses, I think the superdelegate system — there could be a case to keep them. If Obama wins, I think it will be a complete repudiation of them. AMY GOODMAN: What would be the sector of society that would push for the superdelegates to be abolished, the whole system? Where do you see that coming from, as you travel around the country? DAVID SIROTA: I see it coming from people who are appalled at the system. I think rank-and-file volunteers, campaign volunteers, who are involved in this are really —- didn’t know the system existed, are appalled by the system. AMY GOODMAN: No one understands it. JUAN GONZALEZ: But I think that’s true not just of the superdelegates; it’s true of the entire system. JUAN GONZALEZ: —- rather than in the current election. JUAN GONZALEZ: So the entire system is a hodgepodge. AMY GOODMAN: —- because that doesn’t come into play at this point. DAVID SIROTA: And I would say that in general, I think people — this has been an educational experience for people to understand yet another example of where democracy is really thwarted in the very institutions of our political system. I mean, we have an electoral system, as you — an Electoral College system, as you mentioned, that’s completely undemocratic. DAVID SIROTA: You’ve got — well, you’ve got a system where states have electoral votes that are awarded basically on a winner-take-all system. And so, unless you’re in a state that’s very closely divided, the presidential candidates don’t really pay much attention to you or your state, because it’s — the winner-take-all system means it’s less of a one person, one vote. If you live in a state that gave — that one candidate won by one vote, all of your electoral votes go to that candidate. It’s a completely undemocratic system. JUAN GONZALEZ: But you also have a situation where the small states have disproportionate power. JUAN GONZALEZ: —- in a lot of these very small states. That’s extra electoral votes. AMY GOODMAN: What about the movement for a national popular vote? DAVID SIROTA: It’s a hugely, hugely important movement, and let me explain how it works. You know, the Electoral College is in the Constitution, so it’s very difficult to get rid of something that’s in the Constitution. And so, through the Progressive States Network, which I work with, and through other groups, you can create a state legislative way to solve this Electoral College problem. What you do is, you get your state to pass a bill that says we will award our Electoral College votes to the winner of the national popular vote, but only as soon as a majority of states representing a majority of the Electoral College also agree to the same thing, so that what happens is you make sure that your — that once you have states representing — what is it? — 272, 273 Electoral College votes, who agree to this compact, then you’ve got a situation where you have — you’ve effectively overridden the Electoral College vote and created a completely democratic system based on the national popular vote. Whoever — you have a system that guarantees whoever wins the national popular vote wins the election. AMY GOODMAN: You’ve also been very critical of MoveOn. DAVID SIROTA: I’ve been somewhat critical of MoveOn. I’m a fan of their leaders. I like them as people. I think that they’ve been part of an antiwar strategy that has tried to focus all of the attention on the Republicans, and I think it’s been more of a partisan strategy than a strategy to end the war. And I think that’s — strategically, I disagree with it. I also think they’re somewhat of an undemocratic organization, small “d.” And I think that — I use them as an example, because they’re just a very big organization — that on the progressive side, we have a lot of organizations that do not have small “d” democratic control. When you think about MoveOn, there’s no real way to tell the organization that you don’t like what they’re doing or you want them to go in a different direction, other than emailing them. You can email them, or you can take their poll and vote in a poll, but there’s no democratic ownership. It’s different when you think of a group like Democracy for America. If you go onto Democracy for America’s website, if I’m a Democracy for America member and you are, you and I can communicate one-to-one through the technology. With MoveOn, you can only communicate essentially — and there are some — there are a couple of exceptions — but essentially through the central junction box. And so it really hasn’t created a small “d” democratic ownership. And as I say in the book, if we want to create a social movement, you have to make people, the mass public, feel ownership over that movement, real ownership through democratic control. JUAN GONZALEZ: One of the things you deal with, as well, is the emergence of Lou Dobbs as a populist figure and the contradiction of both his — some of his right-leaning and left-leaning policy. We’ve had him on the show here. And I’ll be interested in your further elucidating for us what are his left-wing populist perspectives. DAVID SIROTA: Well, I think out of anybody in the major cable news, he’s the only person who, for instance, talks about corporate power. He’s the only person who talks about the inequities of our lobbyist-written trade policy. He’s really the only person who even acknowledges what he calls the war on the middle class. Now, what I’m critical of him in the book is that — and I think it’s deceptive — is that he segments the issues he talks about. Right? So the best example is, he talks about immigration, and he’s very, very — basically anti-illegal immigration. And he talks about free trade. And never the twain shall meet, right? There’s never a discussion about, hey, wait a minute, when you pass a NAFTA that wipes out a local farming economy, for instance, in Mexico, that you’re going to create a system, a situation, where Mexicans are going to want to come to this country, because they’ve been thrown off their land by our trade policy. Never the twain shall meet. And I think he doesn’t mix them or doesn’t meld them. And I was on his radio show yesterday, and we argued about this. And I basically say in the book, he doesn’t meld them, because that message is more of a, for lack of a better term, holistic message. You’re actually looking at the problem and not just symptoms. You’re not just riling people up; you’re actually going to the heart of the problem. I think his show taps into an unfortunate desire, when he talks about immigration, to — of xenophobia, of scapegoating immigrants. And I think that’s where I disagree with him. AMY GOODMAN: Explain, David Sirota, what’s scaring Wall Street. AMY GOODMAN: Give us the scene. DAVID SIROTA: Yeah, I was at the Exxon Mobil shareholder meeting, and it was with a group of religious shareholders, people representing religious institutions, and they were filing a resolution to ask the company simply to acknowledge and plan for global warming and potential regulation of global warming. Now, just to give you an example of why this is important, Exxon Mobil, according to Friends of the Earth, has produced five percent of all carbon emissions, of human-emitted carbon emissions since 1880. So you get this one company to even acknowledge it and change a little bit, you can make a planet-wide impact. And when they stood up and offered this resolution and it looked like it was going to get a significant amount of votes, you saw CEO Rex Tillerson very, very nervous, sort of moving back and forth. He finally was forced to acknowledge that he thought that global warming is actually really an issue, which is a big revelation, because a lot of people in that company have tried to pretend that it’s not an issue at all. And so, slowly but surely, I think those kinds of direct actions, where — it’s not about the electoral process, right? The shareholder activists said, “I don’t care who’s the president. I don’t care who’s the governor. I don’t care who’s the congressperson. We’re taking matters into our own hands.” That kind of thing, union organizing, shareholder resolutions, direct action is what I think is really scaring money power right now. AMY GOODMAN: David Sirota, I want to thank you very much for being with us. His book is called The Uprising: An Unauthorized Tour of the Populist Revolt Scaring Wall Street and Washington.